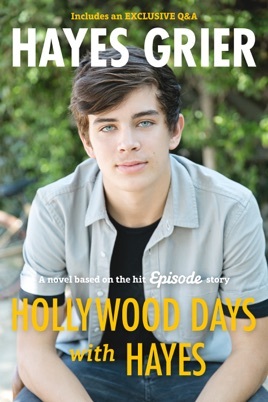 Hayes Grier has just landed his first big Hollywood role, the lead in a big budget blockbuster film. There he meets Violet Reeves, an aspiring writer, who has also been given her first big break. If she aces her new job as Hayes’s assistant on the film, which means making sure he is on time, knows his lines, and doesn’t get himself killed, the director will read Violet's own screenplay. The only problem? Violet has a huge crush on Hayes. She has to keep her emotions in check, impress Hayes, and add some heart to her script. But what about Violet’s heart? Does Hayes feel the same way about Violet as she does about him? Social media superstar Hayes Grier sets this story, based on the hit story on Episode (the world's largest interactive storytelling app), during the hot days and long nights of a Hollywood shoot. In addition to this novel, fans will get an exclusive, never-before-seen Q&A with Hayes, A Perfect Day with Hayes, and some family photos! This was an amazing book and I was sad to end it. I hope he makes a sequel or another book! I LOVE HAYES GRIER!